Note that if you use the links below, I may get an Amazon affiliate commission. This in no way influences my recommendations. Technically only 2 things are required to solder, a soldering iron and solder (there are even some soldering strips that you can activate with a match, but that's getting a bit out there). So let's talk briefly about solder then soldering irons. After that we'll look at some clamping options to hold things in place and then some other tools you might want to consider. Solder comes in basically two varieties, rosin core and acid core. Acid core solder is for plumbing, NOT for electronics. DO NOT use acid core solder for electronics! Pretty much any rosin core solder will work just fine. 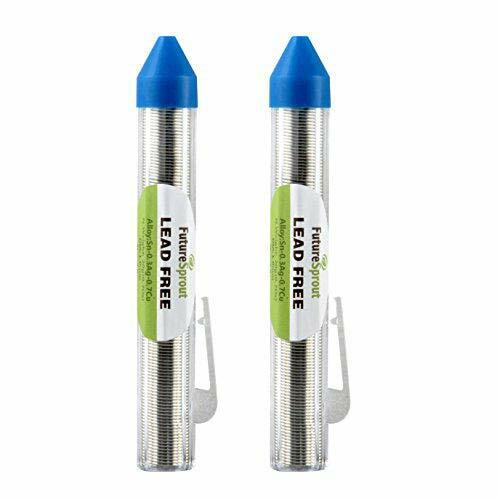 I personally prefer lead-free solder in a small plastic tube (rather than on a roll). While slightly more expense, it is much easier to work with, and easier to carry for field work. You should avoid breathing solder fumes no matter what kind of solder you use, but this is especially important if you buy the (generally) less expensive tin-lead solder. Irons can range from the cheap (sub $10) versions that plug directly into the wall up to thousands of dollars for high end soldering and rework stations. If you are just getting started, you don't need to spend a fortune to get a reasonable piece of equipment. At the end of this section are some soldering options for emergency and field use. Save yourself some frustration and don’t buy a cheaper soldering iron from Radio Shack or Harbor Freight. Especially if you are just starting out, at least invest in a descent tool. For $22 you can get the Velleman VTSS5U adjustable temperature soldering station. It has an analog temperature control with no display so you don’t know exactly where it is set, but at least it’s adjustable. Hakko FX-888D digital soldering station ($99) is an excellent tool for hobbyists. This is the iron I'd recommend if you have any intention of soldering more than one or two small projects. This kit comes with a pair of the best cutters you’ll ever use. I love my Hakko cutters. I have several of them and I use them all the time. If you plan to solder much at all, you are going to want some way to clamp things in place while you solder them. This is true whether you are soldering wires together, soldering parts on a board, or soldering wires to a connector. Again, it doesn't have to be super expensive to be effective. Start with putty and clothespins and then move up to a vice if you find you are doing more soldering. Plasti-Tak (poster putty, adhesive putty, mounting putty, reusable putty) is a great and cheap way to hold parts to boards, hold boards still, or hold wires and or connectors in place while soldering. The cheapest you can find should work just fine (Elmers $4, or Duck $2 add-on). Some people use Silly Putty instead. That works too but I prefer the extra stick and stiffness of the poster putty. Try this video if you want to see it in action (“Blu-Tack” is the same stuff). Wooden (not plastic; they melt) clothespins make a great inexpensive clamp for holding wires, boards, or small parts when soldering. You can cut the angled ends off to make a ‘flush’ or ‘flat’ face to your “clamp” (see picture above). Combine clothespins with reusable putty (previous tip) and you have a very portable, inexpensive, and versatile clamping system. This guy made a fixture to hold the clothespins in place. You could do the same with a piece of scrap wood (1x6, etc.) for essentially free. The Stick Vise ($30) is a great little portable vice for soldering. Takes almost no space and you can 3D print your own jaws if you are so inclined. There are some 3D printable clamps you might consider as well. In addition to clamps, there are a number of other tools you might consider. Three of the most useful are wire cutters, pliers, and a soldering mat. As I mentioned previously, I love my Hakko CHP-170 micro cutters ($6). They are relatively inexpensive, and worth every penny. I have several pair that I keep stashed around so a pair is always within easy reach. 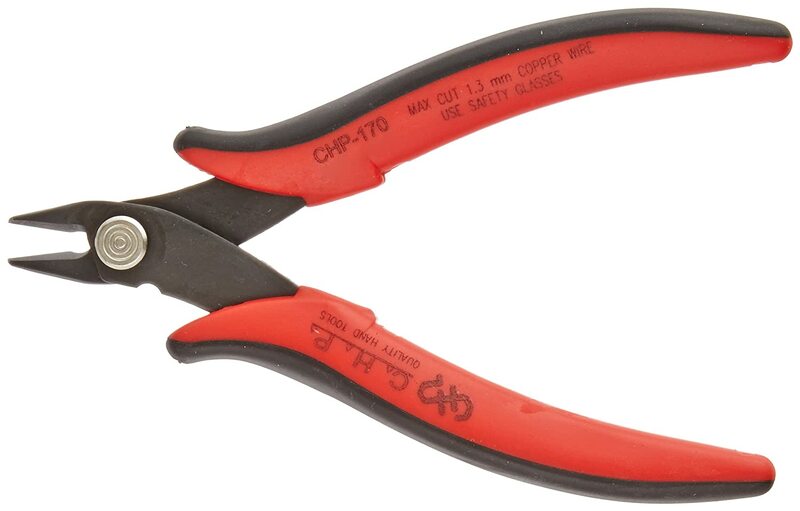 Hakko long nose pliers ($9) are just a pleasure to use. The jaws close nice and flat and they hold parts very nicely. A silicone mat ($7) is one of the best investments you can make. They are very inexpensive but make it much easier to work. It helps you keep track of parts and, unlike your kitchen table, you can’t burn the mat with your soldering iron. 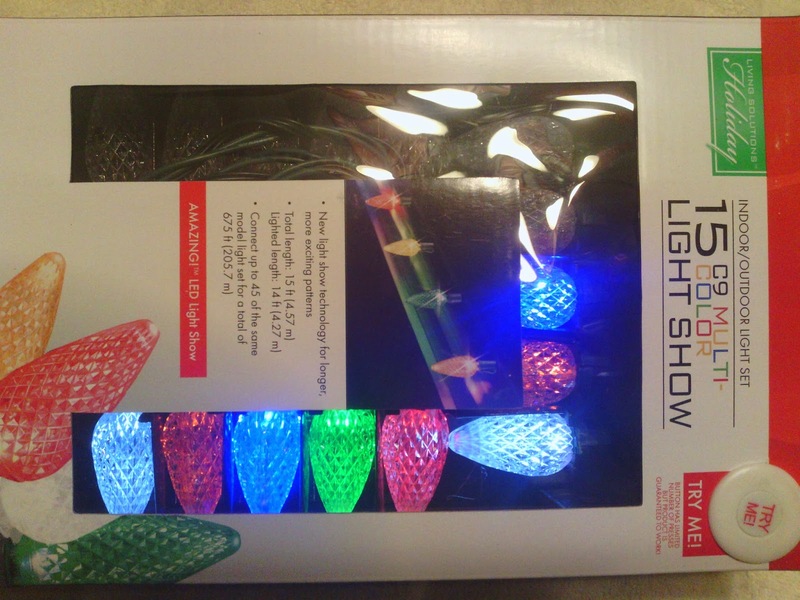 After Christmas I purchased a few strands of the Walgreen "15 C9 Multi-color Light Show" LED Christmas lights (WIC 276754; UPC 049022715905). These have 15 individually addressable LED lights (3 sets of 5 LEDs arranged as red, green, blue, orange, white). If you can find them on sale for a few dollars, they are a great deal. The lights are apparently manufactured by BriteStar (www.britestar.com). Unfortunately they have very little info on their website. It appears that they intend to sell these and other similar light sets directly but they are not quite there yet. Maybe by next Christmas season? Seeing these lights in the package with the little "Try Me" button made it very obvious that the bulbs were individually addressable. The brief demo in the package provides a few patterns. I was immediately curious if they could be hacked to do other things. 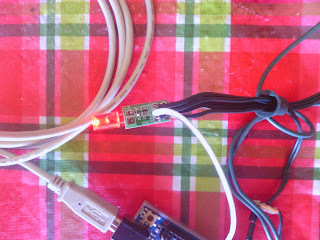 Turns out that the protocol is very simple and easily implemented with an Arduino. A quick look at the string revealed several interesting things. 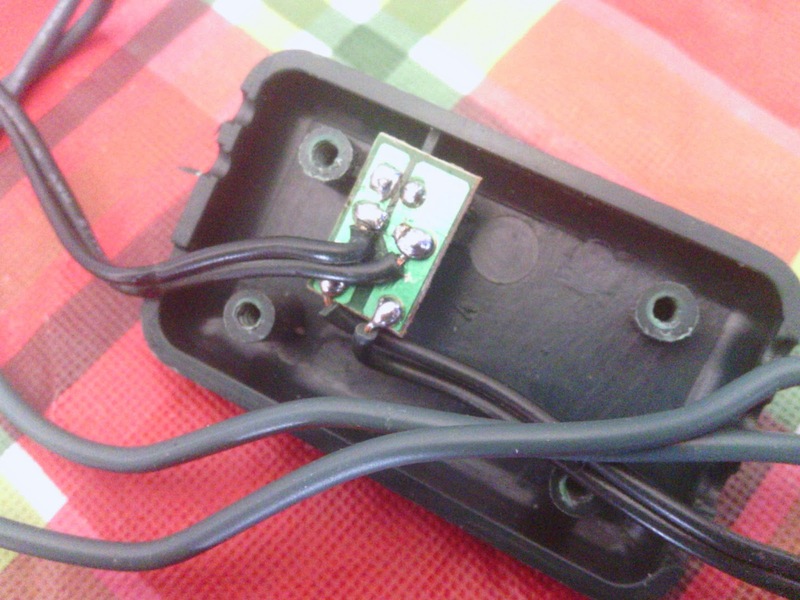 First, there was a transformer at the head of the string labeled 5V at 500 mA. That seemed promising. Second, there was a small box, near the transformer that had two lines (presumably power) going in and out of it, plus a connector for the "Try Me" button on the outside of the package. 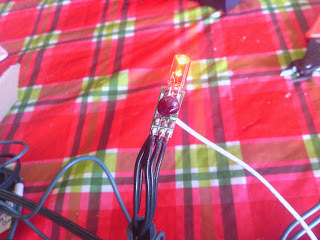 The first bulb in the series had two wires going in and three wires going out. That seemed interesting as well. I started by pulling apart the small box next to the transformer. My initial thought was that this might be the controller for the strand. Alas, that was not the case. In fact, this little box is only there to provide the connection point for the "Try Me" button and is otherwise useless. However, it might provide a good place to slip in a controller (such as the Arduino Pro Mini) later! 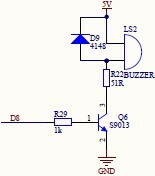 A quick test with the VOM confirmed that the strand ran on 5V DC (as listed on the transformer at the head of the strand). Next I pulled apart the first bulb in the strand. Inside I found a gold mine. There was a simple board with two wires (power) coming in and three wires going out. Two wires were obviously the power and that left one for signal. 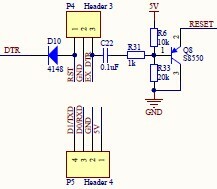 In addition to the inputs and outputs there was a bonded processor and an LED. 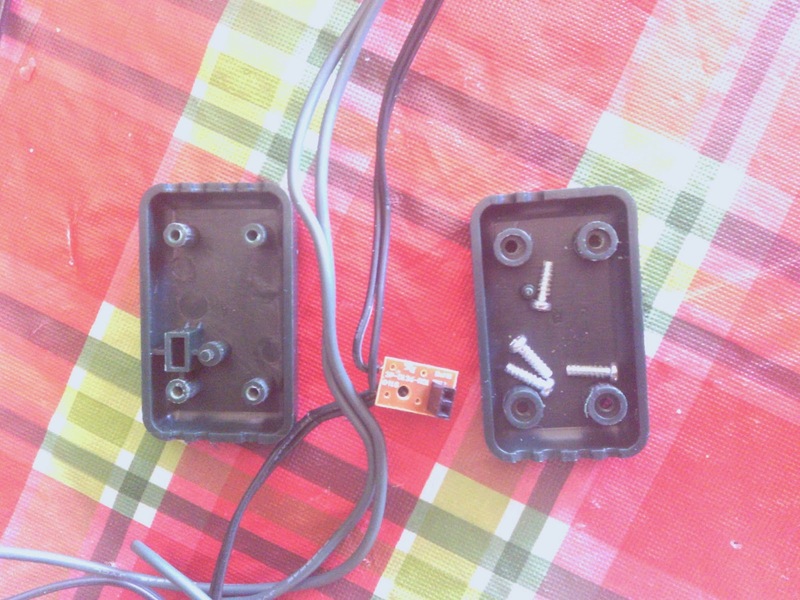 I pulled apart the second and third bulb in the strand and found that the output of bulb one goes to the input pins of bulb two. Likewise, the output of bulb two goes to the input of bulb three. The next step was to reverse engineer the protocol between the boards. First I hooked up the trusty DSO Nano to confirm that the third line was a data line and that it was a 5V signal. Next, I hooked up the Saleae logic analyzer and took a look at the data signals. After looking at the data for a bit it became obvious that there were basically two packets being sent; an "on" and an "off". Below you can see the output of the first three bulbs. It is clear that each board forwards it's previous state on to the next bulb after receiving a new packet. The top line is an "on" packet (note the 4 'wide' pulses at the end). The second line is an "off" packet (note the 4 'short' pulses at the end). It was also obvious that we had a very simple protocol going on. The string of lights is basically a big shift register. Each light stores whatever it is sent, and forwards on it's previous state to the next board. Thus, we can keep pushing packets down the line to update the entire string. The default firmware pushes out 15 packets each time. An "on" packet consists of 4 "one" data bits while an "off" packet consists of 4 "zero" bits. The astute reader may quickly think to themselves, "I wonder what would happen if I sent something other than all zeros or all ones." Excellent question. The default firmware on the string only uses full on or full off. However, the boards support 16 levels of brightness. It turns out that sending any value between 0 and 15 (LSB first) will generate increasing intensity levels in the LED. A packet of SSS (3 start bits) followed by bits 1000 will be the dim value of 1; a packet of SSS0100 is a dim value of 2; etc. You might be wondering how the first board knows it is the master. The short answer is that if you don't see any packets on your input pin, you are the master. A very simple startup protocol is to raise your output pin high for 150 ms (milliseconds) while looking at your input pin to see if you have an upstream neighbor (who would be doing the same thing on their output pin). If you don't see anything on your input, then you must be the master. There is also a failsafe in the system that if you do not see any input for approximately 20 seconds, you should become the master. Likewise, if you begin seeing valid packets on your input, you go into slave mode and start doing whatever you are told. Startup protocol zoomed way out (note the scale at the top of the chart). At startup, the master sends 10 sets of "off" packets. 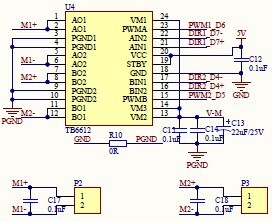 It appears that if a board has no current state, it simply consumes a packet and does not send anything. You can see this in the following capture. Each white bar represents an entire packet. I zoomed out so you can see the cascade of the first three bulbs as packets are being sent. After discovering the basics of the protocol, I quickly created an Arduio program to simulate the protocol and started controlling the string myself. Since the Arduino doesn't directly support this protocol I had to bit bang the line. 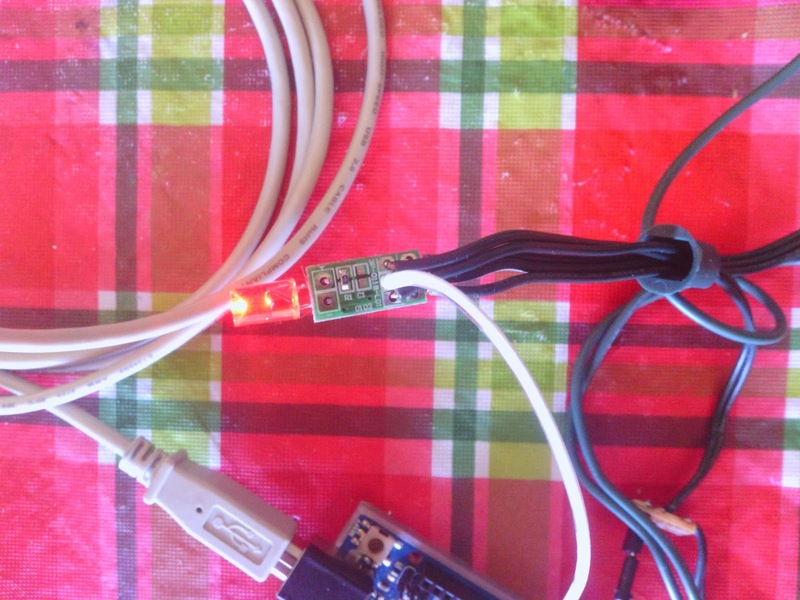 My ultimate goal is to be able to run multiple strings of lights from a single Arduino. Since the times are so short (as small as a single microsecond) I had to disable interrupts during the packet transmission. Source code for a class implementing the protocol and a quick test program is available in github. The default firmware waits about 1.13 ms between sending packets. This gives more than enough time for a packet to propagate all the way to the end of the strand. This seemed wasteful to me so I shortened the gap to 100 us. It seems to work just fine. If anyone has suggestions for improvements please let me know. Also, if you implement this in a project I'd love to hear about it. Please post in the comments below. Read my analysis of research into cell phones and driving. I believe that the studies done to date all suffer from some problems in scientific method. Most of them fail to take into account what I call the 'human factor'. Most people are not idiots, they will not continue talking on the phone (or doing any of a number of other distracting actvities; eating, hunting for a CD, changing the radio station, dealing with a fussy child, etc.) when they are in a dangerous driving situation. 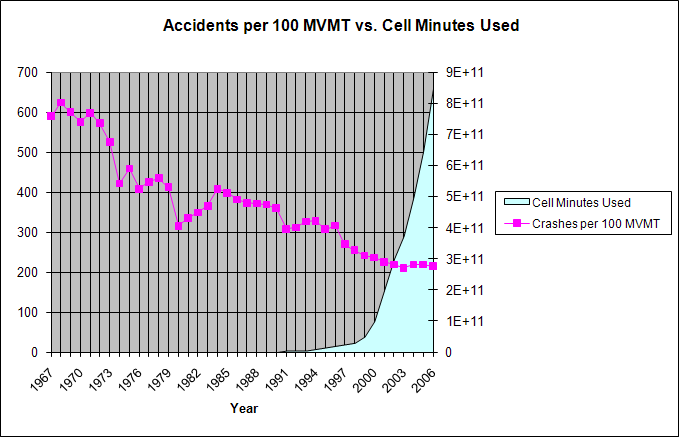 Accident rates continue to drop despite exponential growth in cell phone usage. Either people are not talking on their phone while driving, or using a phone while driving is not dangerous. Either way, I don't think we need legislation preventing us from doing something that is clearly not a significant danger.